The good news is: the more David Levithan I read, the more I adore him. The bad news is: the more John Green I read, the less I enjoy him. This book pretty much cemented my impressions on both of their writing styles, for better or worse. Both Will Greyson's come from a place of internally constructed isolation, both for similar reasons. The way they go about isolating themselves takes differing forms. 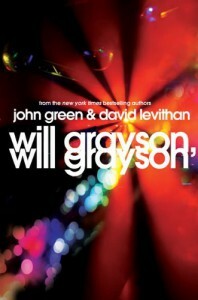 Levithan's Greyson is so filled with self hate that it leaks out of him onto everyone else. He's not a likable person, but he is a realistic and well crafted character. My heart broke for him repeatedly, and in my own way I could relate to him. His sections are painful to read they are so raw. This is all a roundabout way of saying that I really liked 50% of this book, and I was rather ambivalent on the other 50%. There is a lot of great stuff in here. The issue of cat fishing is dealt with so well it actually made me cry. There are some brilliant scenes and remarkable characters. And the way things fold together and then pull apart is very well done. The ending was a bit lacking for me, but I did appreciate what it was doing, and I'm not certain what might have made it more emotionally satisfying. Overall I found this book a worthy read, and a good introduction to both authors.